Perhaps the best wine I’ve tasted to date in my short life. This red blend was the most luscious, fragrant, and best-tasting…again this is a time when my vocabulary in wine fails to share how amazing a drink this was. My best friend, a collector of sorts, brought along this treat to Morton’s tonight to accompany a steak dinner among the fellas. The waiter was enthusiastic about the bottle and–after having some difficulty with the cork–poured generously. All three of us sampled with gusto while we worked through our wedge salads. This bordeaux was like great liquid velvet. 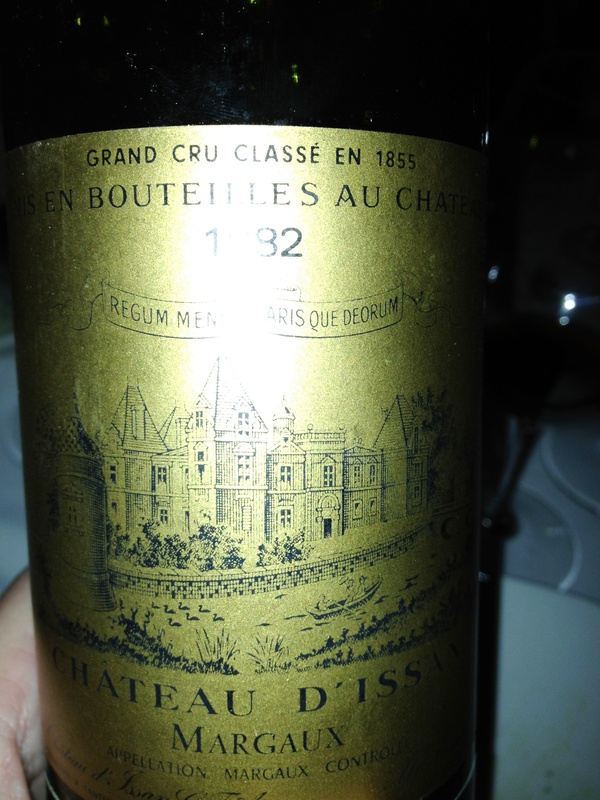 1982 Chateau d’Issan, a fantastic red blend from the Margaux appellation of Bordeaux, France. The 1982 Chateau d’Issan is a red blend from Margaux, an important appellation in the Haut-Medoc district of Bordeaux in southwestern France. Margaux has several chateaux around it, and each must abide to “Appellation Controlee” rules that stipulate where, when, and how wines must be made in order to warrant the AOC Margaux title. The region is famous for its production of well-rounded, gently perfumed wines–predominantly cabernet sauvignon. My friend, if you’re reading this, I know how valuable a bottle this was, and it was worthy every dollar. Really incredible, and a memory that will last a lifetime. This entry was posted in Bordeaux, Red blend and tagged France.